This book had all of the right elements: Jazz Age London, the aftermath of World War I, romance, and an aspiring actress with a humble and sweet personality. It had the potential to hit every one of my buttons. But in the end, I am seriously ambivalent about it. 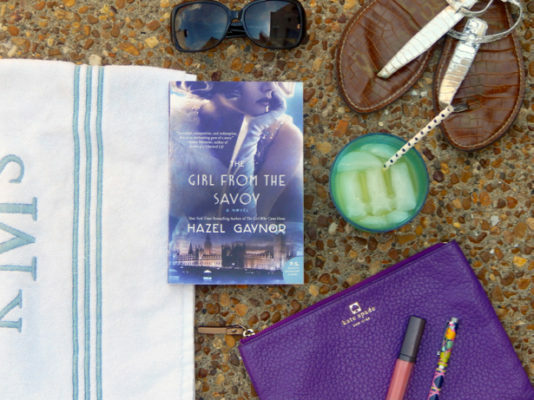 The Girl from the Savoy by Hazel Gaynor follows two women, Loretta and Dolly, in 1920’s London: one a famous, actress from an aristocratic family and the other a lowly chambermaid at the Savoy dreaming of making it big. In a series of coincidental plot twists, their lives become intertwined and Loretta takes Dolly on as her protégé, boosting her to stardom. Gaynor also includes the third perspective of Dolly’s lost love Teddy, a soldier from World War I who is suffering from shell shock induced amnesia. Gaynor clearly devoted significant time to researching the period and the London stage during the 1920’s. Through well placed vernacular and historical figures coupled with an optimistic, lavish atmosphere she gives you a true sense of the period. The behind-the-scenes look at such a famous hotel was also unusual and imaginative. Additionally, Gaynor accurately captured the emotional devastation the Great War caused families and relationships across Europe. Beyond this, The Girl from the Savoy had several problematic elements that I just couldn’t overlook. First of all, Dolly and Loretta didn’t have enough depth and development as characters to really pull them out of their stereotyped parts. On some levels I strongly connected with Dolly’s character, but other aspects annoyed me to no end. For instance, other characters kept commenting on her “something more,” a certain je ne sais quoi that she had, but I never saw it. I hate when an author does this: asserts that a character has certain qualities, but fails to show the reader those qualities through the character’s actions. Furthermore, Dolly’s aspirations for the stage came off as trite and superficial. In contrast, her love and longing for Teddy and her lost baby were palpable. Gaynor didn’t make me believe that Dolly cared enough about being an actress that she would make an all or nothing choice in the end. Finally, the third perspective from Teddy is odd in the overall plot line, especially given the ending. I think the story would have been better delivered had that space been given to the development of Dolly who could have easily related Teddy’s story through flashbacks. Don’t get me wrong – I absolutely adored Teddy. He was original, kind, and charming. In fact, he was probably my favorite character. I don’t want to give the ending away, but I will say, the feminist me applauds it, while the romantic was deeply disappointed, and mainly because of my problem with Dolly’s aspirations. It may sound like I am not recommending this book to you, but on the contrary I think it is a good read just maybe not a great read. I would love to know what you think about Dolly, Loretta, and Teddy. How do you feel about the ending? Want to know what else is on my summer reading list? Do You Know these Southernisms?